In the market for a new family SUV? We recommend checking out the well-appointed, ultra-durable 2018 Nissan Pathfinder in Albuquerque. The new SUV returns with a wide range of improvements, including new safety features like standard automatic emergency braking and an available rear door alert system. Due to popular demand, Nissan's Midnight Edition appearance package has also become available for select Pathfinder models. Adding 20-inch black alloy wheels, a black roof spoiler and black side covers, this option is an affordable way to take your sporty style to the next level. Continue reading our 2018 Nissan Pathfinder review for more details! The SUV is available in S, SV, SL and Platinum trims. Standard features on the entry-level S trim include 18-inch alloy wheels, roof rails, tri-zone climate control, and keyless ignition and entry. 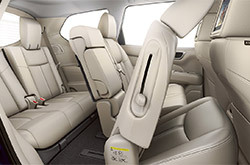 The seven-passenger SUV also covers all the tech bases with standard Bluetooth, an 8-inch NissanConnect touchscreen, a rearview camera and a USB media player interface. For even more amenities, 2018 Nissan Pathfinder reviews recommend going with one of the upper trims. The SV adds foglights, automatic headlights, an eight-way power driver seat and a leather-wrapped steering wheel. Next in line is the SL, which comes standard with a power liftgate, leather upholstery, a four-way power-adjustable passenger seat and driver seat memory settings for perfect positioning. The top-ranging Platinum offers the most luxury and convenience with its 20-inch wheels, chrome exterior accents, LED headlights, power-adjustable steering wheel and towing package. To help keep passengers entertained during road trips, this model can also be equipped with two 8-inch headrest-mounted displays, a DVD player, and USB and HDMI ports (via the Family Entertainment package). 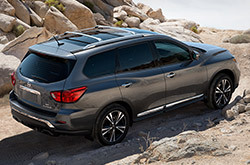 Every 2018 Nissan Pathfinder in Albuquerque comes standard with a 284-horsepower, 3.5-liter V6 that puts out 259 pound-feet of torque. The six-cylinder is matched to a continuously variable transmission. Front-wheel drive is standard, while four-wheel drive is optional. Properly equipped models are capable of towing up to 6,000 pounds. 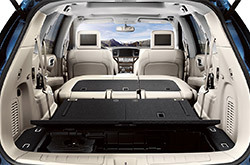 SUV buyers in the Albuquerque area who are looking for outstanding safety gear will find it in the new Pathfinder. Other than the newly added safety features listed above, the 2018 Pathfinder can also be had with adaptive cruise control, blind-spot warning, rear cross-traffic alert and a 360-degree parking camera system. 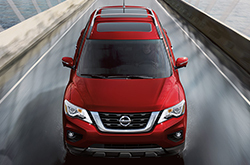 Visit Reliable Nissan today to take the new SUV for a spin around the Cottonwood Mall area! Don't settle for the 2018 Hyundai Santa Fe, Honda Pilot and the Mazda CX-9 when searching for new cars; visit Reliable Nissan to view the venerated 2018 Nissan Pathfinder in the Albuquerque metro area. 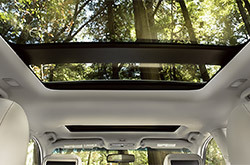 Due to its cabin amenities, polished exterior design and enchanting persona, it could be just the vehicle for you. Confirm if it's perfect for you using our 2018 Nissan Pathfinder review as well as the included third-party compare tool; and if so, make sure you view current financing incentives on our website. We're a resident Nissan dealership where you can find amazing factory offers - not only for the Nissan Pathfinder, but also for other new and Certified Pre-Owned cars. Our review is here to assist you with making a responsible choice when selecting a car, and we hope it includes the resources you need for this. 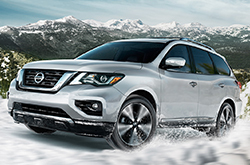 Stop by our dealership in Albuquerque, NM, and explore the impressive Nissan Pathfinder for yourself. Can't wait to see its innovative equipment in the flesh? Check out our video walk-around now! Purchase prices do not include tax, title, license and $299.00 dealer transfer service fee. Prices include the listed rebates and incentives. Please verify all information. We are not responsible for typographical, technical, or misprint errors. Inventory is subject to prior sale. Contact us via phone or email for more details. *MPG Based on 2018 EPA mileage ratings. Use for comparison purposes only. Your mileage will vary depending on driving conditions, how you drive and maintain your vehicle, battery-pack age/condition, and other factors.